Initial reports from Karapatan Southern Mindanao showed that Agusanon residents fled on Sunday from Barangays Kauswagan, Sabud, Mansanitas and San Mariano. The residents along with 224 children evacuated to Barangay Kauswagan Elementary School. After one month and 13 days at the evacuation camp, the Manobo evacuees finally went home to Lianga on August 30. Aboard a convoy of 40 trucks to barangay Diatagon, the lumads left the grounds of the Diocese of Tandag that served as their evacuation camp. But barely a month after coming home, the soldiers are back again, recruiting them to the Task Force Gantangan, a paramilitary group to fight the government�s war against the insurgents. Lumads are made to fight against each other so that big mining companies and plantations can come in and take control of the ancestral domain, said Norma Capuyan, Kalumaran vice chairperson. 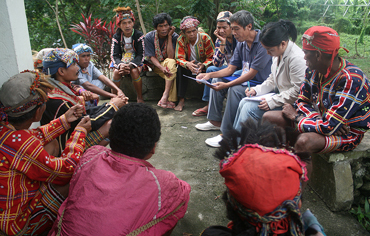 Dulphing Ogan, secretary-general of the indigenous peoples� group Kalumaran, said that militarization remains to be the greatest problem facing the lumads, who are also fast losing their ancestral lands to big mining and plantation companies without their consent. �In other places, a mining firm operates but there are no plantations,� he said, �But in all places, the military presence brings about widespread fear.�Read on.